2017 San Diego Recycler of the Year! Neyenesch Printers joined ten other winners at the San Diego Downtown Library to pick up our award. Each year, the City of San Diego’s Environmental Services Department invites local businesses and organizations with successful waste diversion and recycling programs to apply for the Annual Waste Reduction and Recycling Awards. Neyenesch Printers took the bait and is happy to announce that we were selected as one of the 2017 winners! We are proud to be in the company of some of San Diego’s largest and most recognizable organizations (see all the winners here). Neyenesch is a printing company, one assumes we recycle a lot of paper and yes, we do! In 2017, over 600 tons of paper was diverted from the waste stream. While that’s an impressive number, our sustainability program goes deeper than the paper we recycle. Since the 2015 installation of our UV press, we’ve reduced our VOC emissions by 84% and we have equally impressive drops in our hazardous waste disposal and paper spoilage. Our in-house ink department has given us control over our ink inventory and spoilage. The introduction of a ink recycling program gives us the ability to remix leftover inks into new colors, reducing the amount of ink leaving our plant for re-purposing. We’ve added STEM batteries to collect and store energy during low peak hours and replaced all lights bulbs with LED lighting. We’ve re-certified our Environmental Management System to the ISO 14001-2015 standard and our Quality Management System to the ISO 9001-2015 standard. These programs give us the tools we need to set sustainability and spoilage goals and to measure our success. Our Forrest Stewardship Council Certification encourages the use of sustainability produced papers with approximately 90% of our paper supply chain certified. All Neyenesch employees are trained and encouraged to participate in our recycling efforts. There are recycling bins at every desk and work station. Bottles, cans, scrap metal and plastic are all separated and recycled. We have 20 dumpsters in our production area, 19 of them are for the collection of recyclable materials. 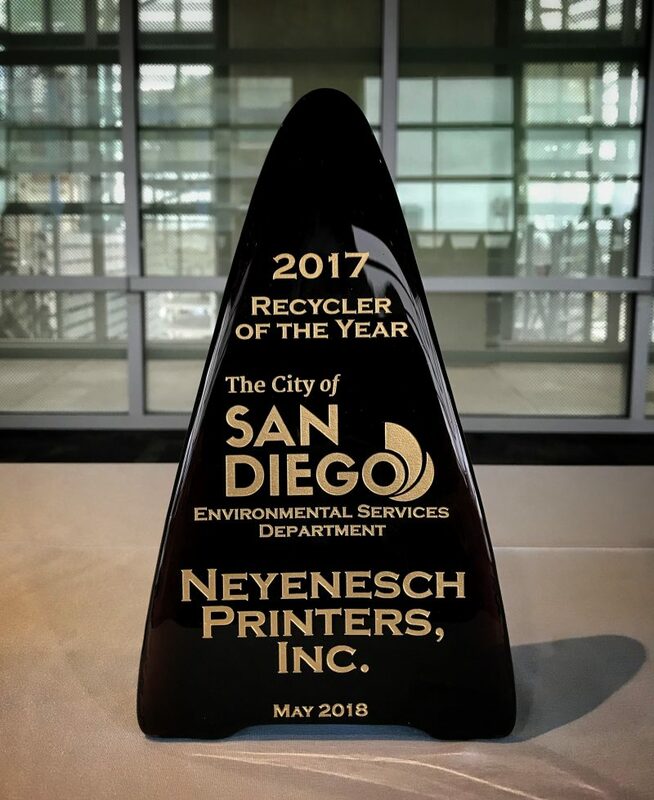 Neyenesch Printers is proud of our sustainability efforts and proud to be recognized as a 2017 Recycler of the Year by the City of San Diego. Congratulations and a job well done by all the winners!